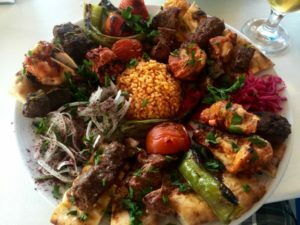 Top 10 things to eat in the magical city of Istanbul, Turkey - Must. Eat. World. Most people are very friendly, helpful and nice and then there are idiots catcalling female tourists or trying to scam the male ones. There is absolutely no alcohol in the Old Towns but booze is free flowing around Taxim/ Begloyu/ Istiklal/ Galata area. There is a separate street/area for absolutely everything that you could possibly imagine. There is one area for socks, one for power tools, one for underwear, one for cleaning supplies… you get the drift. 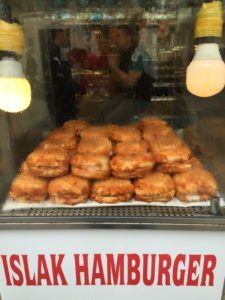 For all of the dichotomy and weirdness that Istanbul offers… one thing is certain, the food in Istanbul is simply AMAZING just about everywhere. 1. Lokantaşi: These are essentially the cafeterias in Turkey. You go in everything is laid out on counters and all you have to do is to point at the stuff that you want to eat. and they’ll serve it to you. These place tend to be packed for lunches because the working population eats their lunch in places like these. 2. Mevkii: These look like you are eating at someone’s home. There will be a few women running the place out of their kitchen. They will made food for the day and you go there and again point at the stuff that you want to eat. They will heat/ finish cooking it before serving it to you. 3. Mehane: This is the equivalent of a tapas bar. 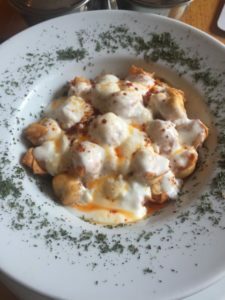 The menu is full of traditional appetizers that you order to share between your group and you eat it all with some Raki or beer. 4. Ocakbaşı: These are typical barbecue joints with a coal grill that they use to churn out delicious kebabs. 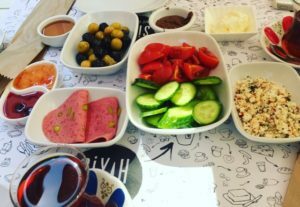 On to the food, here is a list of things that you must try while you’re in Istanbul and most of Turkey. Adana Kebabs are a combination of lamb and beef with spicy seasoning. My personal favorite. Bourdain called it Torpedoes of Love. Vertical rotisserie meat usually chicken or lamb served as a wrap. solid just about everywhere but go to Durumzade… Bourdain went here. While we are on the topic of breakfast, I wanted to point out that just like there is a street for everything… there is also a street (well technically two but right next to each other) for breakfast :). Check out Celebi Oglu Sk. I recommend this place called Siyah Cafe and Breakfast. You won’t be disappointed. 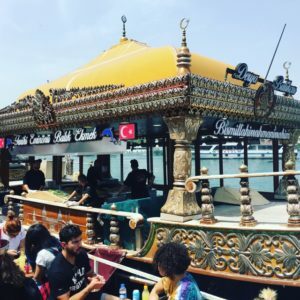 In Eminonu and Karakoy, you will find some boats that are grilling fish. next to it are some small tables and chairs… something like this. These places just serve one food… Balik Ekmek or fish bread. These places are packed with locals and you’re going to struggle to find a seat. Don’t let that discourage you.. find a table get a soda. and buy a fish sandwich and enjoy. It is super cheap and a very authentic Istanbul experience. Manti is ravioli stuffed with meat (and sometime veggies) served with yoghurt,spices, mint and a red sauce. Some places (very few) will make the crispy fried version called Firaya Manti. Delicious. This is another breakfast that I loved. 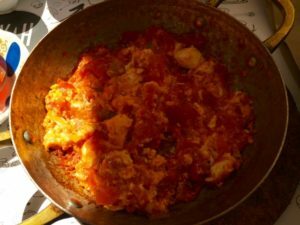 Eggs cooked with lots of tomatoes, onions and garlic and some seasoning. Simple and simply amazing. I think this is one of the best snack food… ever. 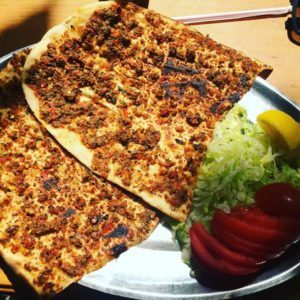 thin dough bread is covered with seasoned minced meat and baked. 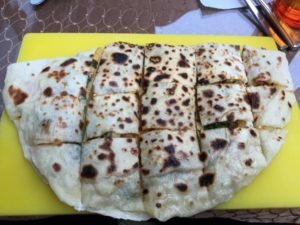 Many people (read tourists) call it the turkish pizza. I wouldn’t call it that and you shouldn’t either. But you must eat this. Bread baked with cheese and meat or vegetables. This actually resembles a pizza much more than a lahmaçun. You can be put off by the way this burger looks, thin and slightly reddish on the out side, looked like some one dipped bread in sauce. But looks can be deceiving. Islak burger has a meat patty inside and that sauce on the outside is just delicious. You will find old ladies making this in some restaurants. Stuffed bread filled with meat, cheese or veggies. I had mine at Hala Manti but you can try other spots as well. It is all good. I can go on an on about the food… There is a lot more to try. There are way too many dishes in turkish cuisine to cover. Eggplant filled with meat, meze vegitarian platter, couscous, rice. And it’s all very good. If you’ve had everything that I mentioned, you should have a pretty good understanding of the street food in Istanbul. 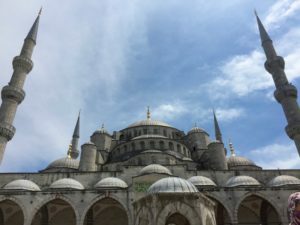 Most tourists stay in Sultanahmet, which is the old city. My advice is to stay close to Taxim Square, Galata Tower or Istiklal Street for the following reasons: 1. You won’t find any alcohol in the old city, and 2. Most young folks are in this area. You will find many nice bars such as Leyla Teras which is a live music rooftop bar (highly recommended, but get here around midnight). Galata area is full of small cafes, some bars and cool stores. This entire area is known as Begloyu and this is exactly where you should be after sunset. Great.I w ish I could follow u .Bless u. Deep thought! Thanks for corgbinutint. This artilce is a home run, pure and simple!